Calculating the proper reorder quantity of each item in your store or warehouse at any given time is the foundation of efficient inventory management. Most inventory management systems leave it up to you to determine the minimum stock level and reorder quantity for each component. But how do you effectively decide what those numbers should be? We have the answer. Our solution doesn't require you to manually determine minimum levels and reorder quantities. 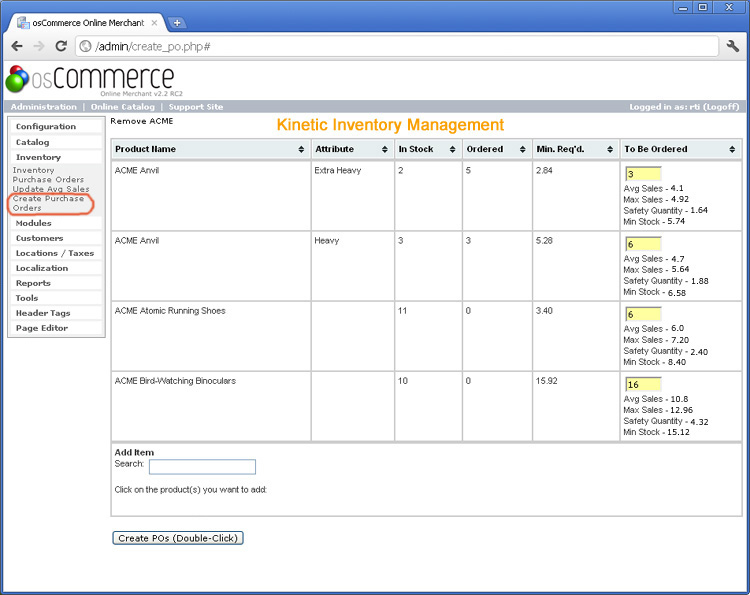 Instead, you let the Kinetic Inventory Management program do the calculations for you based on your own real-time inventory and average sales data. The advantage with this approach is that when you are ready to place an order with your vendor, you will be ordering only those items needed at that time and in the quantities needed to satisfy your sales demand until you are ready to place your next order. The result of these calculations is the 'Minimum Required' quantity described in more detail below. The screen shot above from the Create Purchase Orders screen shows several example products where the 'Min. Req'd' is displayed as a reference number in the column just to the left of the 'To Be Ordered' column. It is important to know that this key number is based on average sales, vendor lead time, the quantity already in stock, the quantity that may be on a previous purchase order, and a factor allowing for potentially greater sales without running out of stock called Max. Sales. You can find the theory and discussion describing the calculation of the numbers below elsewhere on this site. The 'To Be Ordered' column is simply the 'Min. Req'd' quantity rounded up to the nearest whole number multiple of whatever quantity you decide (or your vendor requires you) to order at a time. Using the Atomic Running Shoes as an example again, you can see that the 'Min. Req'd' is calculated at 3.40, but the 'To Be Ordered' field displays the number 6. This is because this particular item must be ordered in quantities of 6 at time. You can set the default multiple to whatever you want as well as modify this value for any item at any time directly from the inventory spreadsheet page. Please keep in mind that the 'To Be Ordered' column is the recommended ideal quantity to order. You can modify this number directly from the Create Purchase Order page based on your specific needs. You can also search for any item not showing as needed right now from this page if you want to add more stock of a particular item based on an anticipated increase in demand. Copyright © 2019 PH Technologies, LLC. All Rights Reserved. Designed by Free CSS Templates.